There's a distinctly techie tone to this week's review: no one's sent me an iPad2 (yet) but I do have a couple of goodies for the iPhone and iPod to tell you all about. Both are designed to convert the little gizmo to a full-size stereophonic music machine, and the first adds DAB and FM radio to the mix too. In a world where small is beautiful the idea of attaching your iPhone to anything huge and cumbersome seems counter-productive; but small doesn't have to mean cheap and tinny, as both of these products go to show. 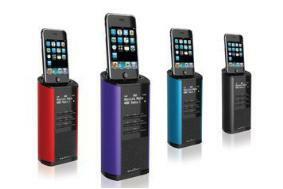 First, at the top end of the range, is the Magicbox Tower - a high-spec dock that's compatible with almost all the iPod/iPhone range. With its built-in DAB/FM radio and alarm clock, it stands just 15cm high and is available in a range of colours. My daughter and her friends have been trying this out during their sleepover this weekend, and the verdict is 'really good, plays really well (I can vouch for that!) and the sound is crystal clear but... ' (yes, there's a 'but') 'my iPod feels a bit flimsy stuck on top like that without any support.' I can see what my daughter means; apart from the connector there's nothing to support the device that sits atop the tower, with the result that it seems rather vulnerable to getting knocked. Especially in a household with children. Although small, it certainly packs an acoustic punch and it's small enough to travel almost anywhere with you, should you want it to. It retails for about £70 and is widely available online and in the High Street. Next, the AirCurve Play. If anything, this is even more versatile as it doesn't require power - either mains or battery. 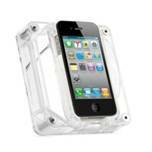 That's because it's a simple cradle with an acoustic chamber to enhance the sound of your iPhone or iPod speakers. You'd think it would be pretty basic, and I suppose in technological terms it is. But it certainly does what it says on the tin (or rather, box) and amplifies the sound to the level of 10dB - more than enough to make for social listening, video-viewing or conference calling. And the best thing about it is - no wires! This retails for between £10 and £15, making it excellent value-for-money as well as economical to run - not only because it doesn't need powering up, but because by allowing you to play your iPhone/iPod at a reduced volume (yet still be heard) it's a battery-saver too. The final gadget on this week's list has been keeping me connected during this sleepover weekend as a combination of teenage girls and multifarious gizmos drain the bandwidth on the home wireless network. Actually, as a TalkTalk customer, sporadic broadband is something I'm not unused to (who isn't?). All of which makes the Mobile WiFi dongle lent to me recently a real blogging 'must have'. Connected to the 3 Network, this Huawei modem (E585) is as straightforward to use as it looks: turn on, enter network key and off you go. Although we're not in the best area for signal strength on 3 (as we know to our cost with our 'phones) I've connected to my own personal MiFi network on the train, on the station platform, in the park and generally whenever I've been away from home. I've also - as suggested - used it when the home network's been playing silly buggers (which it has a habit of doing) and I've yet to find a problem. It's simple to use, and it works. Which is just about the best you can say about anything in this category. Oh, and it's cheap too - £49.99 with a pay-as-you go option or £39.99 with a £15 a month contract. There is no great secret to my blog and twitter name; 'tis all rather boring I'm afraid. My blog is called Utterly Scrummy as that is my nickname amongst friends. I make and bake loads and enjoy giving food away to my friends, neighbours, teachers at school, refreshment table at church, etc. Everyone says that my cooking is scrummy, a few of my friends called me Utterly Scrummy because I they think I am generous giving away scrummy home baking and meals so the name just stuck. So now you know... And if you're one of Utterly Scrummy's neighbours, you must be very, very lucky. Wonder what she's cooking up for Sunday lunch? Apple blah blah. Ipod grumble grumble. Ipad phooey. No I am not at all jealous of anyone who owns one of these, whatever gave you that impression...? 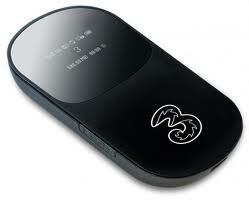 Oh how I miss the MiFi!! I had that to review too and as you say, it's a bloggers must-have piece of equipment. I recently had to cancel Internet usage on my mobile phone, needless to say I feel lost in the wilderness with no Internet access when out n about. Also loving the look of the aircurve play, would be great for my stepson. You mean they made you give it back TMM? I knew I should've kept them waiting for my review! I'm learning to love it, Moiderer, learning to love it very much indeed... In fact, I'm not sure how I'm going to manage without it! Sigh. Must get an ipad again so I can get more things to go with it. Another iPad Pippa? What happened to the first one?! !